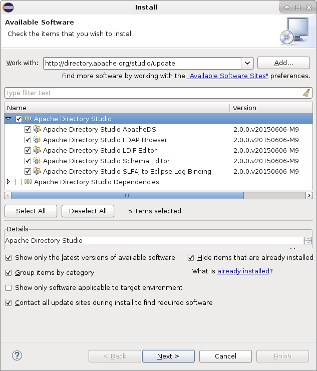 The Apache Directory Studio plugins require Java 8 or newer and a recent Eclipse version. In the opened wizard input http://directory.apache.org/studio/update into the Work with: text field and press Enter. After a while the table below will show the available categories. 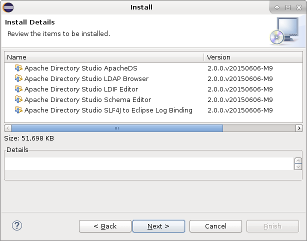 Choose Apache Directory Studio. You don't need to choose Apache Directory Studio Dependencies, the required dependencies will be automatically installed if required. Click Next. Review the installation details and click Next. 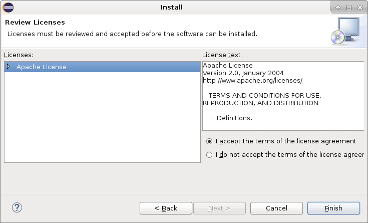 Accept the license agreement, Apache Directory Studio is licensed under the Apache License, Version 2.0. Click Finish. Apache Directory Studio plugins are not signed yet, so you have to agree to the warning. 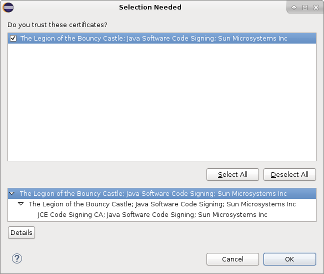 You also have to trust the JCE Code Signing CA. 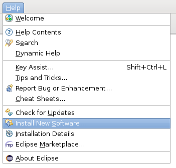 After installation it is recommended to restart Eclipse.